Twist Consultancy is a direct marketing specialist helping to improve how businesses connect to people. TRAINING. EMPOWERING YOU TO CREATE GREAT MARKETING. From first steps to creating integrated & automated campaigns, we have a course for you. TWIST. LOOKING AT SOMETHING IN A NEW WAY. We use what a business already has, reshaping this to improve your marketing results. Twist Consultancy is a direct marketing specialist helping improve how businesses connect to people. Working directly with both clients & agencies, our focus is the same; to boost your marketing success through developing more relevant, personalised & targeted campaigns. Clearly articulated engagement strategies with defined delivery plans. Marketing resource plus fresh ideas & deployment experience. Team support with the advantage of a client side perspective. From first steps to email automation. we have a course for you. What does ‘great’ look like? Often the hardest part of creating & reviewing your marketing plan is knowing where to start. Our process provides the key considerations, taking you through a structured review to match your offering with the needs of your customers. With a clear approach to both relevantly aligning your business to your customers & then reaching them, it’s a great foundation for your marketing strategy. 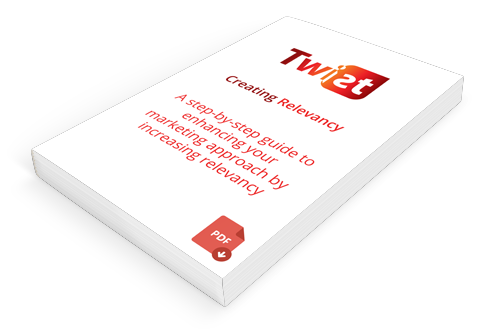 To help you get started, why not request our free guide to creating relevancy. Thanks for requesting our guide. In return we'll be adding you to our newsletter subscription. You'll be able to unsubscribe at any time. We approach all projects with a focus on our key principle that commercial success is achieved & maintained through engaging relationships with customers. This engagement is achieved from a clear focus on creating relevance across content & delivery. Personalised, timely & of real value to the reader. We work on a trusted network basis, pulling in the key skills and experience required for your project from across a pool of known expertise. It captures the essence of looking at something in a new way, taking what a business has & reshaping it to improve marketing performance & conversion. It’s also a little fun & has personality, which is how we like to do business. With over 17 years agency and client side experience across a number of verticals & marketing requirements, the consistent focus has been the use of the customer experience to shape & optimise marketing strategies. A selection of client feedback for Nick Crawford our Owner & Principal Consultant. As an interim Account Director Nick demonstrated a great ability to quickly understand the strategic intent of an integral CRM project midway through its launch phase. Nick was able to apply experienced insight & drive a strong structured approach in his time working on the team, aiding our progress enormously. Nick headed up the Travelodge eCRM team & delivered 100% revenue growth in his time with us. He has an excellent attitude & was invaluable in delivering new functionality & methodologies to our customer communications. I would recommend Nick to any business without reservation & hope to work with him again in the future. I worked with Nick for two years. In that time Nick always demonstrated a great understanding of digital marketing & kept himself on top of new developments in the industry. This enabled Nick to add significant value to our strategy. On a personal level Nick is great guy to work with, very approachable & always good fun to be around & I would recommend him to any potential clients. I had the pleasure of working with Nick for around 3 years. Throughout our time operating on multiple accounts for discrete businesses, Nick was always aligned to the objectives, well versed in both technical & creative marketing aspects & clearly well prepared to meet any challenges faced. Nick is an asset to any business, & delivered tangible growth in revenue & profits. New ideas articulated so that they are relevant. How can we improve content, user experience & technical solutions. Fun to work with.